One summer day as a man was walking along the shore, he saw off in the distance a little figure moving about like a dancer. He began to walk faster to catch up. As he got closer, he saw that it was a little boy who wasn't dancing, but instead he was reaching down and picking up something and very gently throwing it into the ocean. 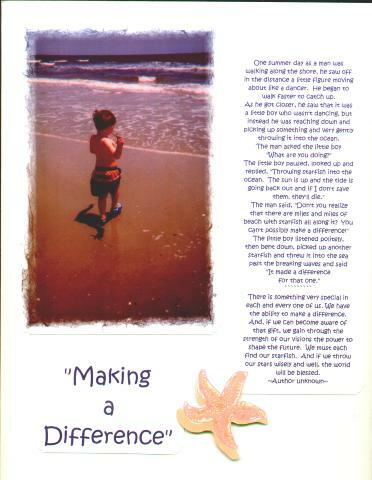 The little boy paused, looked up and replied, "Throwing starfish into the ocean. The sun is up and the tide is going back out and if I don't save them, they'll die." The man said, "Don't you realize that there are miles and miles of beach with starfish all along it? You can't possibly make a difference!" There is something very special in each and every one of us. We have the ability to make a difference. And, if we can become aware of that gift, we gain through the strength of our visions the power to shape the future. We must each find our starfish. And if we throw our stars wisely and well, the world will be blessed.